Happy Monday everyone! I hope your weekend was a lovely one. My weekend was full of cuddle time with my kiddos and errand running (mostly by myself!). It was a perfect low key weekend. The temperatures have dipped back down to “normal” January temperatures which means it is f-f-f-freezing! I don’t let the cold temps get me down. Instead, I decided to whip up a batch of soup to warm us up. It seems I have been on 30 minutes or less dinner kick lately. While the chicken poached, I sauteed the vegetables and cooked the rice. What I love most about the soup (and soups in general) is there is a TON of inactive down time while it simmers away. 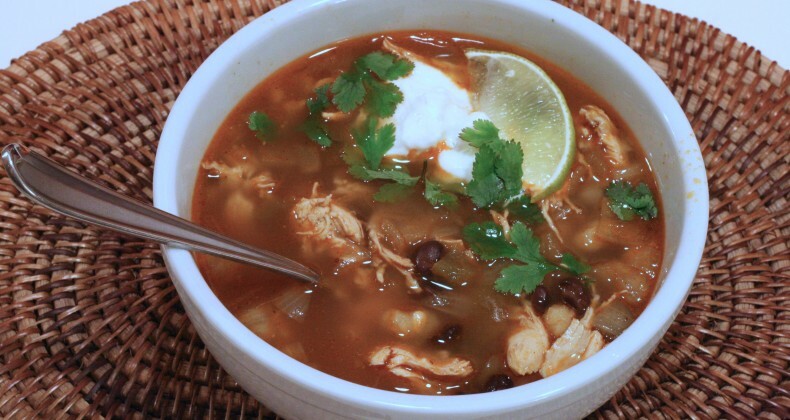 If you’re looking for a quick soup to warm you up tonight this is the soup! Not only is this a quick soup but it is a healthy soup. You get to enjoy almost 2 cups of soup for about 330 calories. 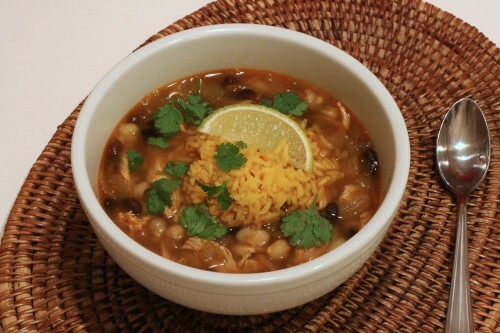 If you have resolved to eat healthier you can add this soup to your line up of healthy foods. I added the option of serving a small scoop of yellow rice with your soup to make it more substantial. We enjoyed our soup with a side of rice and a small cheese quesadilla. I used Vigo Yellow Rice. 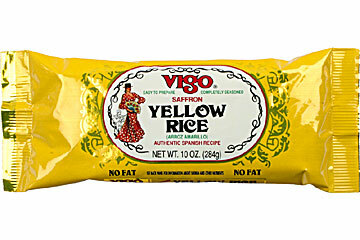 I love their rice products and this yellow rice was a perfect addition to this soup. The seasonings in the rice didn’t overpower the soup at all. Don’t worry if you don’t have any on hand, regular brown or white rice would work in a pinch! Trim off any fat off the chicken breasts, place into small sauce pan, season with bay leaf, salt, and cumin. Cover with water. Bring to boil. Once boiling turn down to low and partially cover. Simmer for 10 minutes. Turn stove off and cover the sauce pan. Leave sitting for 20 minutes. Once done, remove chicken and shred with two forks. If you are serving the rice cook the rice according to package instructions. In a large pot over medium heat pour in the oil. Sautee the onion and garlic until softened. About five minutes. Add in the chilis, beans, hominy, spices, and chicken broth. Simmer over medium low heat until the chicken is done. Add in shredded chicken and serve with a scoop of rice or your favorite garnishes. Looks yummy! May have to have Grandpa try this one. How do you cook the chicken breast. I tried them in a soup and they felt rubbery. I had cooked them in a pressure cooker. Any advice on a different method of cooking the breasts. I don’t have experience cooking in a pressure cooker, Cynthia. I believe that when you use a pressure cooker you don’t have to cook meat for as long. I would adjust your cooking time with the chicken breast to see if that helps. Make sure to test the thickest part of the chicken breast for doneness with a meat thermometer. It should register 165 degrees F.
I just had this soup for the first time and i live it.